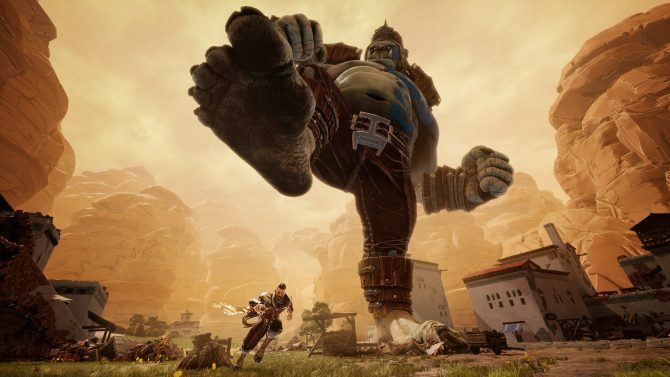 If you are looking for a game that will give you an adrenalin rush by letting you fight a giant ogre, then you may come away satisfied from Extinction. In recent years, Iron Galaxy Studios has become known for their work on fighting games like Killer Instinct and Divekick. 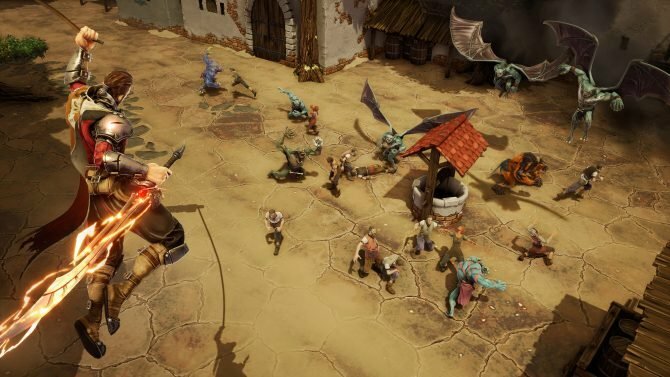 That being said, the studio’s newest game Extinction breaks that mold by being an action game where players fighting giant ogres called the Ravenii. I have always found it interesting to see developers mainly known within the industry for their work in one particular genre branch out and try something new. It can lead to fresh, innovate titles in other genres due to the different perspective those developers bring. The studio’s ambition to develop something different does result in some spectacular Ravenii-slaying moments that make the game’s smaller, more focused moments intense and memorable. Unfortunately, when looked at as a whole, Extinction suffers from repetitiveness, an incredibly bland story, and some technical issues. In Extinction, players are defending the Kingdom of Delorum, which is the last bastion for humanity. Almost out of nowhere, the Ravenii came through portals from another planet, and began to kill and destroy everything in sight. Main characters Avil and Xandra are the last members of an ancient order called the Sentinels, who supposedly saved the world from a Ravenii invasion a long time ago, and go to Delorum to get the help of King Yarrow in order to escape the clutches of the Ravenii. While the premise does seem somewhat interesting, the plot winds up very dull. Most of the story is told through exposition-heavy dialogue once players complete a mission, with barely anything happening on screen. While the voice acting is decent, things quickly get boring. Events that sound intriguing and multiple character deaths happen off-screen and are just told to you, which causes the story to feel very disconnected. The only big highlights in the story are flashback scenes, and that’s mainly due to the fact that they are actually showcased through animated cutscenes. Unfortunately, these are somewhat randomly peppered in throughout the story with minimal relation to what’s actually is going on, and the story they tell is pretty predictable. 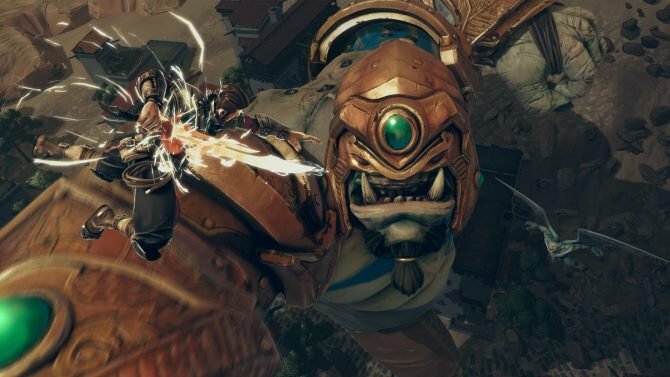 If Extinction’s story had been integrated better into its gameplay, it may have been more engaging, albeit still very formulaic. Sadly, we are stuck with a story that tells more than it shows, all just to lead up to a lukewarm and fairly predictable ending. While the voice acting and bits animation are enjoyable, the story Extinction is telling is not. One the bright side, it doesn’t overstay it welcome in length. Extinction fortunately fares better on the gameplay side of things, though even this is flawed in a few areas. As I briefly mentioned before, Extinction is split up into missions, each of which has a main objectives and side objectives for players to complete. Some levels are even randomized, which may keep the story fresh on repeat playthroughs if you decide to just go through and ignore the plot. If you aren’t fighting the Ravenii as Avil, you are running around to summon portals to save civilians and killing the enemies that attack them. It’s pretty basic action game fare, though the game does attempt to have an interesting take on basic combat. While there is only one attack button, players can time and hold button presses to craft specific combos. There are even other techniques like cancelling a move mid-animation, which is a clear carry-over from Iron Galaxy’s fighting game roots. While there is depth for dedicated players to get into, the combos that I discovered I discovered weren’t that useful, so I didn’t really use them unless I was attacking a damage-sponge of an enemy. The enemies also don’t hit you often enough to make cancelling that important; it’s easier in some scenarios to just ignore them and activate the portal to whisk the surrounding civilians away. While this gameplay base is just serviceable, it does feed into and influence the most enjoyable thing in the game, taking on the giant Ravenii. 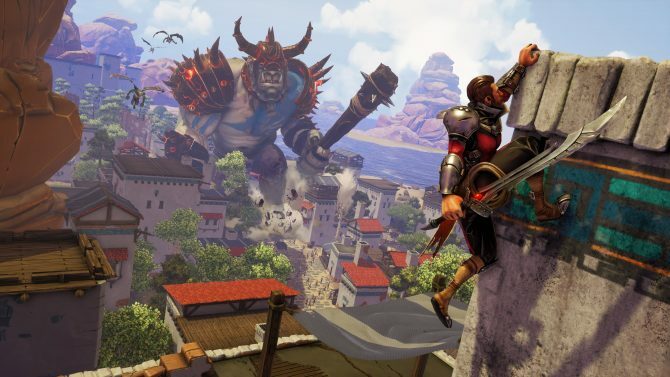 Extinction boasts a pretty fluid movement system that makes climbing and traversing the game’s various environments pretty fun. Each level has a ton of added verticality, which helps when taking on the Ravenii. While some levels will just have you saving civilians or killing smaller enemies, most of the main story chapters have players take on some Ravenii, whether it be to kill a certain number of them or defend some watchtowers. Avil has the ability to pull off a Rune Strike, which slows time around him and allows him to target a specific part of the Ravenii, who all wear armor with special attributes. While Wooden armor can be taken out with a simple Rune Strike, others can be more difficult to take down. Players may have to destroy locks, wait for the Ravenii to attack before striking, or have the giant beast hit itself to hurt their own armor. Armor is randomly generated on almost every Ravenii too, which keep encounters with them fresh. Once their armor is taken care of, and one of their limbs is bare, you can hit it with a Rune Strike to disable the Ravenii. Cutting off an arm will make it harder for them to attack, while cutting off their leg will cause them to fall over of a little while before the limb regenerates. To kill a Ravenii, their head has to be sliced off, which can only be done with a special Kill Strike. By saving civilians, killing enemies, and cutting off limbs, one’s Kill Strike meter will rise. In order to kill a Ravenii, this has to be maxed out an their neck needs to be exposed. Once all these requirements are met, their heads can be chopped off in a satisfying fashion. Killing Ravenii can be super exhilarating, and very rewarding after a tough fight. Avil is pretty fragile when fighting, as are the destructible environments, so killing one of the giants does feel like quite the accomplishment the first few times you do it. Each area of city itself has its own life bar, so players will have to make sure the Ravenii don’t do too much damage in each scenario. Fighting the Ravenii is the best part of the game by far, which makes me wish some of the aforementioned gameplay and story fluff was cut out in favor of more ogre slaying action. It’s a fairly unique gameplay situation, with the closest comparison being the Attack on Titan games. Still, the main campaign can sometimes get a tad dull as players have to focus on the story and some level objectives that don’t have to do with killing Ravenii, and even when you do, things can feel repetitive, environments blend together, and the formulaic “save civillians, kill smaller enemies, kill Ravenii” objectives begin to feel samey, and are only hampered by a story that doesn’t go anywhere interesting. That being said, Extinction shine more in its side modes. While still a bit repetitive, the Daily Challenge and Skirmish modes both have players fighting through mostly enjoyable randomly generated levels, and don’t have to worry about mediocre story weighing things down. The biggest highlight of the whole package is the titular Extinction mode though. In this mode, players have to fend off wave after wave of Ravenii for a high score, fighting until their Avil or the city he is defending are completely decimated. 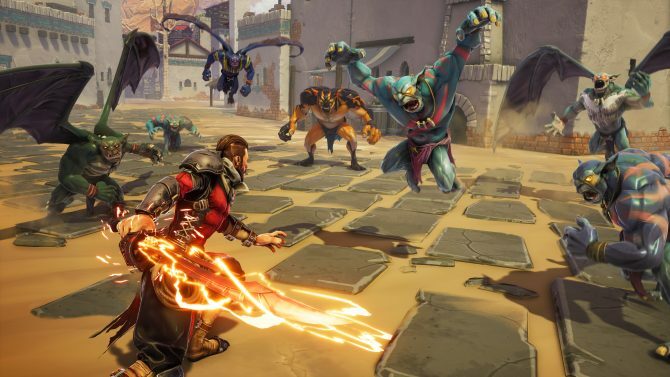 Extinction mode focuses the most on the best aspect of the game, killing Ravenii, and thus comes out the most memorable mode in an otherwise underwhelming package. If there is one mode I will be returning too in Extinction, it will be this. On the technical side of things, Extinction tends to be a mixed bag. Environments are colorful, but areas designs all blend together and the visual design, even of the Ravenii, aren’t incredibly memorable. While the game tries to keep up with all the action on a base PS4, the framerate did start to chug the further I got into the game when more was happening on screen. I also did run into a few random glitches that caused me to reload levels, but these never impeded progress too much and can be patched out in the future. If you are looking for a game that will give you an adrenalin rush by letting you fight a giant ogre, then you may come away satisfied from Extinction. When you are felling a Ravenii in slow motion, things can get real gratifying, you just do have to trudge through a ton of mediocre and repetitive elements to get there. Extinction’s story and some repetitiveness do ultimately let the package down as a whole, but I am glad to see Iron Galaxy tried tackle a different idea outside of their comfort zone, even if it didn’t pan out entirely.